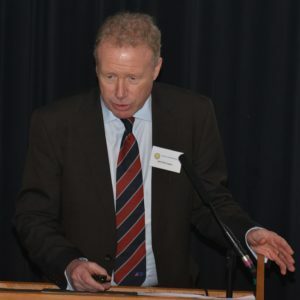 The Institute of Demolition Engineers returned to their traditional Spring Seminar location of the Leeds Royal Armouries for yet another sell out event. Both in terms of companies wanting to show off their products and industry professionals attending for the excellent range of speakers, the venue was packed yet again. President David Darsey welcomed everyone to Leeds before thanking them for their tremendous generosity in raising funds for his chosen charity; Niemann Pick UK. During the last AGM in London, the kindness of both IDE and NFDC members had jointly raised £20,000 to help children and adults with this debilitating disease. 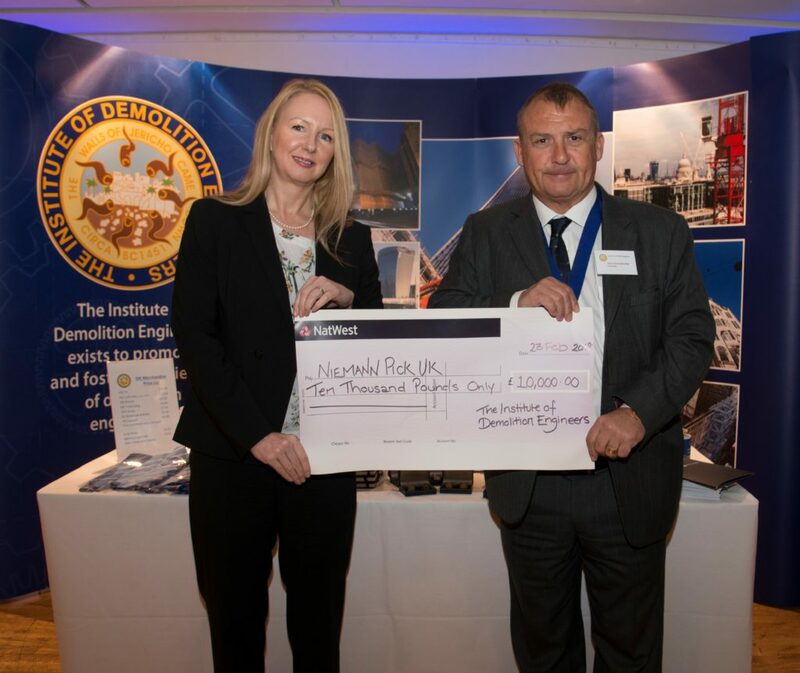 David welcomed NPUK Chief Executive Toni Mathieson to give the audience a brief overview of the charity and its work before presenting her with a cheque for £10,000. The first speaker of the day was Andrew Dyson who gave a talk on Erith’s project to demolish Hull PowerStation. The extremely detailed talk took in the need for the company’s care and consideration for the demolition process as this was the first power station with hanging boilers to be demolished since the Didcot disaster. Thanks to the massive resources available to the company in both technical engineering, plant and experience, the project went off without a hitch. What was surprising to both the Erith team and the audience was the lack of interest paid to the project by the HSE considering its nature and similarities to Didcot. 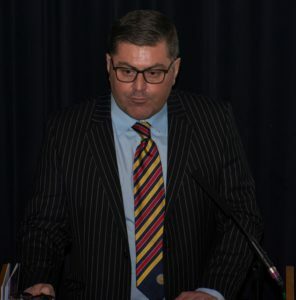 Curtins’ Russell Bowman took to the stage to speak about the issues faced by demolition contractors when it comes to UXO (Un-exploded Ordnance). Curtins Presentation UXO Apart from the usual hazards taken into account when excavating land such as services and voids, the probability of exposing UXO is extremely high, particularly in inner city locations. Whilst the UK still maintains a zero casualty record when exposing ordnance, the patchy hazard assessment and risk assessing of UXO still remains. According to official figures, there are over 40 calls per month for the military to deal with varying types of UXO. Stephen Andrew, ABB Ltd.’s Demolition and Decommissioning Manager arrived to speak about the issues faced by his organisation when awarded a contract to demolish a series of petrol stations. The small number of contracts soon ballooned to over 500 locations around the country. Stephen spoke about the issues faced with the organisation and logistics involved in delivering extremely tight programs in often highly urbanised locations. “Dealing with the proximity of the public is always a difficult situation but more so was the garage operator who, once the forecourt was closed to commence the work, would be placing orders for items to be delivered in a few weeks’ time with no thought of issues arising with the works.” During the contracts over 2000 tanks were removed, 100km of bore holes drilled and 2 million tonnes of hazardous material treated. As market leader in their particular sector of the demolition industry, Able UK’s Neil Etherington was on hand to describe how his company undertake some of the largest projects in the country. Talking specifically about their work on the Shell Brent oilfield, Neil spoke about the huge infrastructure operations involved in preparing their docks at Seaton to receive some of the largest top decks ever made. Where rigs where once broken down at sea into smaller component parts, recent innovations in lifting and cargo carrying saw the Shell Brent platforms being dismantled in a single piece at sea and barged to Seaton for full decommissioning and dismantling. The work undertaken at Seaton includes a 306m long quay with a capacity of 60t/m2. 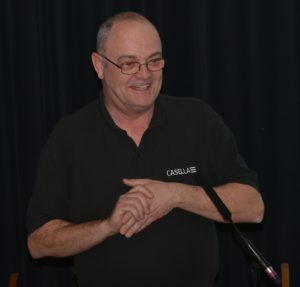 The issue of noise, dust and vibration monitoring was discussed by Casella’s Shaun Knott. Shaun spoke about the way in measurement of these hazards has been made easier by the introduction and development of easier monitoring methods. Whilst measuring these hazards is far easier, there is still the requirement to inform employees about the issues and protect them with the appropriate PPE at all times. Regular IDE Seminar speaker, Wayne Bagnall was next to the stage to talk about the hidden issues of asbestos within reinforced concrete. Wayne Bagnall Ltd_Asbestos in RC for IDE Leeds rev01_ 23.2.18 While surveys can identify asbestos which can be seen or sampled, there are serious issues with asbestos being hidden within concrete structures. Wayne first faced this issue when a survey he was undertaking found that the mesh reinforcement chairs within a concrete slab were manufactured from asbestos. Whilst later resin or plastic chairs are clear, the smaller versions had fallen over during the pour and were just about visible at ceiling level. Standard demolition methods would have processed the chair into the concrete in the slab resulting in a contaminated product. The demolition team therefore had to find and mark as many of these chairs and process around them which became excessively time consuming. 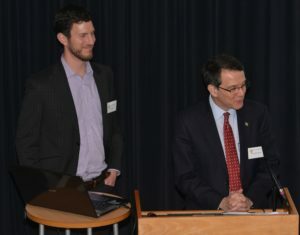 Closing the busy day Dr John Henry Looney and Kris Atkins from Gloucestershire based consultancy, Sustainable Solutions Ltd who were on hand to talk about the use of BIM, Building Information Modelling, in deconstruction projects. Sustainable Direction DRIM Presentation The use of BIM in designing and building virtually all major projects in the UK has been prevalent over the last decade but its use in assisting with the latter stages of a building’s life has never been brought to attention. With the drive towards recycling and reuse, the belief is that BIM should be used to create buildings which are able to be recycled, rather than simply demolished. 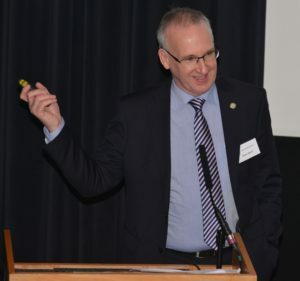 The day was rounded off with David Darsey thanking everyone for their attendance, the great speakers and reminding everyone of the IDE Scottish Seminar on the 6th of July at The Royal Society of Edinburgh.